Our Checked Flannel Duster is as close to an instant favorite as you're likely to find. Made of soft, easy-care, yarn-dyed cotton, this flannel house coat's colors won't fade - and its comfort will last for years of satisfying wear. 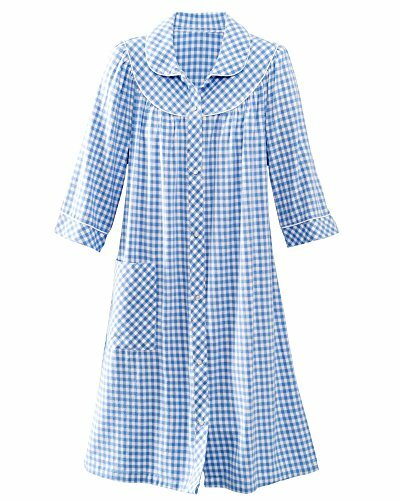 Its snap front design means it's easy to wear, and its ¾ sleeves and patch pockets add to the everyday appeal of this women's flannel duster. * 100% Cotton * Cozy flannel duster's yarn-dyed cotton will keep the colors from fading * Snap front women's house coat design for easy wear * ¾ sleeves and patch pocket for convenience * Imported * Machine wash and dry * Sizes: Misses S, M, L ; Women's 1X, 2X, 3X * Approx. Lengths: M 42'', W 43''* Buy 2 or more and save $3 off each! Approx lengths Misses 42", Womens 43"